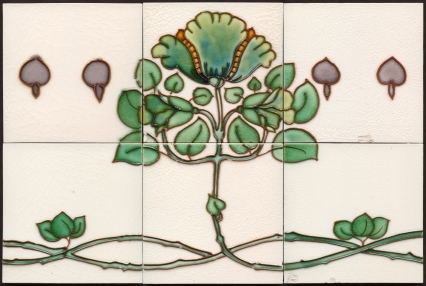 In the middle of the Edwardian art nouveau design was very fashionable and new tile designs were introduced very frequently, these artistic limited edition tiles were mostly made in the tubeline technique and were about double the price of similar moulded tiles. Tube line tiles were also often made as one-offs, for special protects where moulding majolica tiles was not cost effective and sample tiles which would then be moulded. Post edwardian times as the fashion for highly decorated tiles waned it was too expensive for manufacturers to introduce many new designs of embossed tiles and so most new designs were tubelined. Tubeline has remained in use ever since but generally declining in volume produced over time until 'reproductions' began appearing in the last two decades of the 20thC. Most of the designs reproduced as tube line tiles were originally embossed and lack the tonal hues achieved by translucent glazes over relief moulding. Tube line is also sometimes called slip trailed which is not correct but perhaps helps to picture the process in action. Tube line is generally misunderstood and misused, very many people erroneously describe moulded majolica tiles as tube line even in some of the standard literature. For a more detailed description see this page. The outstanding features of tube line tiles are rarity and the ability to use most brilliant colours and glazes as the outline prevented glazes running in to each other.